Let’s start at the beginning: you need to attract people to your content. Creating Attraction content is the first step in a successful content marketing strategy and the focus of our first lesson. Attraction content is freely available on the web for social sharing and for search engines to index. Your goal for this content is for people to consume it and spread it. In other words, this is the content that drives traffic — ideally, a lot of traffic. 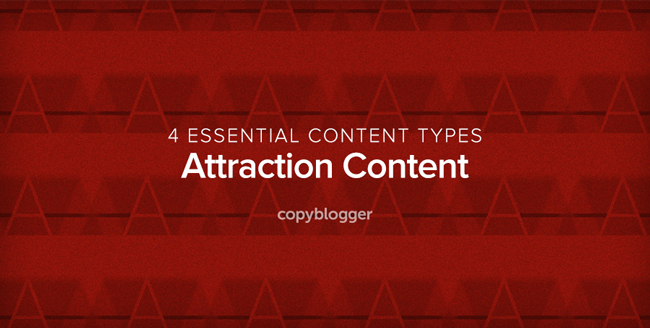 Let’s look at a few examples of Attraction content. Call them what you will, but creating a high-quality article around a numbered list like the 109 Ways to Make Your Business Irresistible to the Media simply works. And, yes, you will typically see better results from higher numbers (as long as you make each point a beefy, satisfying item). But Ernest Hemingway’s Top 5 Tips for Writing Well or The 7 Things Writers Need to Make a Living prove that short list articles can also be popular. The most-shared piece of content on Copyblogger is an infographic called 15 Grammar Goofs That Make You Look Silly. We’ll dig into why it works so well — and why it doesn’t — below. Both of these infographics were large drivers of traffic and social shares the year they were published (2014). And check out these articles if you are interested in learning how to make winning infographics without risk or transforming your ho-hum infographic into something extraordinary. Give people resources to make their lives easier and they will be happy to share them with others. That’s the purpose behind downloadable assets like worksheets, checklists, and inspirational posters. Definitive guides and content libraries fall into this category, too. Definitive guides are resources like QuickSprout’s The Complete Guide to Building Your Personal Branding or Moz’s Beginner’s Guide to SEO. These are monster resources that pile up the inbound links, generate thousands of social shares, and dominate the top rankings in search engines. Content libraries like My.Copyblogger accomplish the same result, but instead of focusing on one topic, we offer 15 different ebooks on topics ranging from copywriting to content marketing to landing pages. And yes, in exchange for one email address we give you access to all 15 ebooks. If you are interested, you can read up on the results of this approach in a report published by MarketingSherpa (spoiler alert: the experiment was a smashing success, in more ways than we imagined). Another method for attracting new people to your content is creating slide presentations and publishing them on SlideShare. On Copyblogger, we publish a new post with a SlideShare presentation embedded in it, like we did with 10 Rules for Creating Content People Can Trust. By doing it this way, we drive our Copyblogger audience to view the SlideShare, which then (we hope) raises the number of views to a point that it gets featured on the SlideShare home page. Since all of our slide presentations point back to Copyblogger, this additional exposure potentially introduces us to new audience members. Sometimes you don’t have to create all the content by yourself. You can ask your audience to provide the raw material for you. That’s the idea behind surveys. A survey is also a great way to establish yourself as an authority in your industry by becoming the go-to source for the latest research on a particular topic. In fact, we used a survey to launch our native advertising series, and that survey attracted a number of links. The SEO software company Moz elevates its authority and visibility in the market by releasing its annual search ranking factors report. Surveys are a reliable way to attract links. Stats are another way to reuse content (whether they are yours or someone else’s) to drive traffic to your site and attract links. For example, take a look at NewsCred’s 50 Stats You Need to Know about Content Marketing downloadable report, which is also a SlideShare. As you can see, and as you will continue to see over the course of this week-long series, Attraction content can embody a number of different formats and mediums. You can also transform one piece of content into different formats and mediums. Almost two years after we published Stefanie Flaxman’s 30 Quick Editing Tips Every Content Creator Needs to Know, we updated it and turned it into a SlideShare presentation. In another case, an infographic became a series of podcasts and then eventually became a series of articles. And don’t forget, you can always republish old blockbuster articles to expose them to a new audience. Now let’s discuss a common problem with Attraction content. As I mentioned above, a great example of Attraction content is our 15 Grammar Goofs That Make You Look Silly. This is easily our most popular post. It’s generated a ton of links and social shares. In addition, it’s driven a lot of traffic to our site. But there is one problem with the traffic. And it involves delivering the right value to the right type of person. Unfortunately, many of those people who find Copyblogger through Grammar Goofs are not part of our target audience, so they tend to drift away. They care about grammar, but not content marketing. This is not always an entirely bad thing. Traffic surges can lead to surges of free publicity. Let me explain. In their early stages, Buffer published hugely popular posts on body language and happiness. They were great posts, but I always thought it was strange for a social media app company to write about these topics. Until I understood what they were doing. See, those popular posts were getting picked up by big-name media sites like TIME and The Huffington Post, which drove a ton of traffic back to Buffer via the links embedded in the articles. As expected, the conversion rates were low, but Buffer got publicity from these articles. This is (sometimes) the beauty of content syndication. Eventually, though, Buffer narrowed its content focus to attract the right audience. Once they reached a critical mass of visibility and traffic, it was time to focus on conversion. The same was true for Copyblogger. Attraction content is now typically part of our content mix about once or twice a month. Let’s close with a couple of thoughts about when you should use Attraction content. New websites. Your new website will need a heavy dose of Attraction content to get attention and links. If you publish twice a week, for instance, you could publish Attraction content once a week. This ratio is a good starting place because it’s not easy to predict which piece of content will become a stellar performer. Mature websites. In general, it will take you anywhere from six months to two years to start seeing your content rise in the search engines, regularly get shared, and routinely pick up links. Once you reach that point, you may want to publish Attraction content about once or twice a month. It’s comforting to remember that it’s quite easy to blend your Attraction content with other content types, like Authority and Affinity. This way, you not only drive a lot of traffic to your site, you also attract the right type of traffic. Fortunately, we will discuss Authority content in tomorrow’s article. See you then. Do you have any questions about Attraction content? Drop us a line in the comments section below. And let us know about your favorite piece of Attraction content (whether you or someone else created it). One question about attraction content. I have two pieces of attraction content that are doing very well relative to the site as a whole. One receives over 2/3 of the total traffic on the site, ranks very well in search engines, and has been linked to by some popular and well respected sites in the industry. The other receives about 1/2 of the remaining traffic, ranks reasonably well in search engines, and recently picked up a very important link as a go to tool from one of the biggest players in the industry (and has been growing in popularity by leaps and bounds since). However, I’m having a lot of trouble getting people to explore beyond these two pieces of content. I’ve tried internal ads, I’ve tried recommended content types of internal links, I’ve tried newsletter sign up forms and. I know these two pages have to be the beginning of something very good but I can’t figure out how to get people to move on beyond these to explore the rest of the site, subscribe to the newsletter at a decent rate, or do anything else that would get me closer to a sale. This is a long way of saying how do I get people to move beyond this attraction content to become newsletter subscribers, explore the blog, or otherwise become regular visitors and/or potential customers? I feel like I’m missing a huge opportunity but I don’t know how to take advantage of it. Hey Ryan, great question. Do you mind sharing the links to those two articles? Without seeing them, though, my hunch is that the articles are too broad, not focused on the right target. Kind of like the same problem we had with the grammar goofs inforgraphic. Conversion boils down to 3 things: the copy, the offer, the list (in other words, the audience). If the copy and offer is good but you are still not moving people down the funnel, then you are attracting the wrong type of people. That’s my hunch without seeing the actual articles. I’d love to look at them. Thank you for taking the time to respond and consider my dilemma. These are more tools than articles. Maybe that’s part of my issue? I’ve been mixing in Google ads with my internal ads at a 3:1 ratio. Maybe that’s a bad idea but I needed to find some way to monetize this. I probably also need a lot of work on the landing page but I’m not even getting clicks so the landing page isn’t even being seen. Again, I appreciate you taking some time to consider this. Yep, you lack a good offer. Those are great tools and you are probably attracting the right audience, but what are you offering them to stick around? Thank you for the thought. I’ve been thinking about an offer to extend for newsletter subscribers. I’ll have to focus my efforts in that direction. I should also play up what is offered within the services I advertise internally and play those up better. I never expected such a personalized response. I was just hoping for some good general guidelines. Thank you so much. I have some work to do! Also, thank you for this series. As you can tell, it definitely has me thinking. Thanks, again Demian! You’re my favorite. Did I just say that? Anyways, loving this series….it’s so helpful to break content down into it’s various types. Can’t wait for more. And thanks for the myriad examples! 15+ open tabs later (all stemming from this article), I realized that once again I’d fallen into the Copyblogger rabbit hole. This series is great. Really helpful to break down what these four types of content are all about, and I appreciate your work here. Looking forward to the next three. The results played out pretty close to what you described. Traffic was particularly good from 9gag dot com. Didn’t convert much, although it did bring attention and who knows how many sales it lead to later on, after some folks saw the site and recalled it. Or subscribed to the newsletter. Today’s article is making me relook at Attraction content and consider your advice of maybe once or twice a month. I’m leaning toward once a month. Chief, you’ve over delivered again today…can you keep it up? Oh please. We all know the answer to that. Can I keep it up? Well, we have the rest of the week to see. Thanks for swinging by, chief. Once again, you’ve blew my mind with this post by sharing the types of attraction contents. I really find it relevant, useful and educative. Good to hear I blew your mind. That distinction and examples are good. Loved them. Attraction content is the fuel of new blogs. Without them, they won’t see the growth. Breaking down everything, I see attraction content as the most viable source of traffic and link’s. I feel like the value of “bad traffic” (meaning unrelated content) is decreasing pretty steeply since search engines appear to be prioritizing topical relevance more than link count. I suppose the next big challenge would be to figure out how to make traditionally boring topics into “attraction content”. Hi. Excellent series! I love it! I’m working with content marketing in videos and I publish a new tip every day. How many times you think i should publish attraction content per week?